Spencer Savings Bank recently wrapped up its “Movies Under The Stars” series with two final events in Elmwood Park and Garwood. A crowd of almost 400 attended the events which have been a hit all summer long. On September 28th, Spencer partnered up with the Elmwood Park Recreation Department to show the feature film Hotel Transylvania at Boro Field. 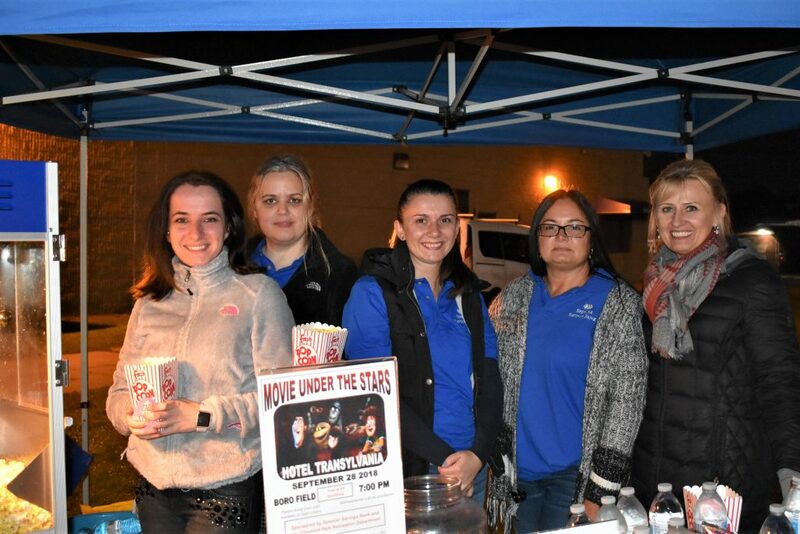 On October 5th, Spencer partnered up with the Borough of Garwood and the Greater Westfield Area Chamber of Commerce to show the feature film Coco. With the good weather still here, it was a wonderful way for families to get out and enjoy some warm evening nights under the stars – with their loved ones, a fun movie and warm popcorn. Join us in 2019 for our next Movies Under The Stars series. Events start at sunset and information is usually posted around town a few weeks prior. Spencer employees are always at the events, serving freshly popped popcorn and beverages to the crowd – with raffles, prizes and all types of fun activities. Come early to grab a good spot and bring your blankets and lawn chairs. See you in 2019 for more Spencer movie magic!